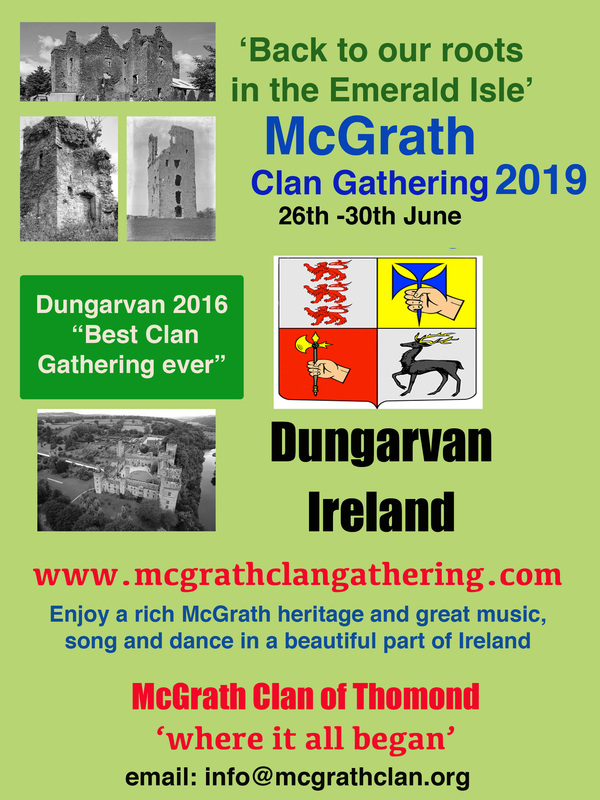 There is an optional post Clan Gathering tour to other part of Ireland with strong McGrath connections. Day 1: Takes in Rock of Cashel, Cahir Castle, Bunratty Castle and overnight in Co Clare. Day 2: Day Trip around Clare with visit to Islandmcgrath, the are where the clan originated, places of McGrath interest. Both the world famous Cliffs of Moher and the Burren will be included. Day 3: Travel part of West of Ireland to Donegal/Fermanagh taking in Yates County and arrive at our base that evening. Day 4: Visit places of McGrath interest in Fermanagh/South Donegal including Castlemcgrath in Pettigo and Lough Derg. Day 5; Return journey to Dungarvan, stopping at Dublin Airport to allow connecting flights or time for people to spend a few days in Dublin. This tour will include travel, accommodation ( B&B in hotels) plus evening dinners. This entry was posted in Uncategorized on November 21, 2015 by McGrath Clan (official).